Many of the 205 returning members of the M.D. program classes from 2005, 1995, ’90, ’85, ’80, ’75, ’70, and ’65 and their guests took time out from reminiscing with classmates and exploring the many changes around Ross Hall to listen as Jeffrey S. Akman, M.D. ’81, RESD ’85, vice president for health affairs , Walter A. Bloedorn Professor of Administrative Medicine, and dean, and several key members of his senior staff discussed many of the latest developments in GW’s School of Medicine and Health Sciences (SMHS) and the M.D. program in particular during the dean’s annual State of the School Address. The dean opened by updating the audience on the school’s strategic plan, unveiled at the end of the fall 2014 semester. In the process of formulating its goals for the next three years, the school maintained the core mission of education, research, and healing. To bolster that core mission, the strategic plan focuses on five pillars: leadership, education, discovery, community, and clinical excellence. To support that emphasis on research, the university and SMHS have been investing in facilities. Perhaps the most visible example is the new 500,000 square foot multidisciplinary Science and Engineering Hall located across 23rd Street from Ross Hall. Beyond bricks and mortar, however, there are numerous examples of the growth in research enterprise. Among those, Akman pointed to the successful selection of GW as the host the D.C. Center For AIDS Research (CFAR), the National Institutes of Health (NIH) grant initiative to establish core facilities across the country that provide expertise, resources, and services to support high quality AIDS research projects. “This is a spectacular collaboration between schools, research institutions, and universities across the city with GW serving as the primary site and NIH grant holder for this initiative,” Akman said. Progress within SMHS extends beyond the M.D. program, and during his address the dean pointed to many of the developments in the health sciences programs. “For some of you, we didn’t have health sciences when you went to school here,” he said. “But today, health sciences, the non M.D. health care programs, are very important to our school. Following Akman’s remarks, Richard Simons, M.D. , senior associate dean for M.D. programs, presented an overview of the M.D. program by painting a picture of this year’s entering class and providing an update on student satisfaction based on the Association of American Medical Colleges annual survey of graduates. The Class of 2019 includes 179 newly matriculants, representing 78 undergraduate institutions including GW. It’s the school’s largest class in terms of total applications in school history and includes Fulbright and Howard Hughes scholars, a Clinton Fellow, and students who have volunteered with Teach for America, AmeriCorps, City Year, Peace Corps, and National Institutes of Health. One thing most of the incoming class has in common is experience in the laboratory. Nearly 80 percent of students reported prior research experience, and 47 have published in top research journals such as Annals of International Medicine, Oncology, Journal of Neuroscience, and The Lancet. From the incoming class, Simons pivoted to the most recent M.D. program alumni. Each year, Simons told the audience, prior to graduation, fourth year medical students from across the country complete a satisfaction questionnaire from the American Academy of Medical Colleges about their medical school experience. “It gives us the opportunity to compare our student’s perception of their education with those of other institutions nationally,” he said. Despite that increased competition, the SMHS Class of 2015 enjoyed a 100 percent match overall, with 96.3 percent of students matching in the first portion of the residency match (compared with 93.9 percent nationally), with five students matching through the supplemental match. Simons continued that, in addition to the match rate being important with regard to where graduates go, it’s also important in terms of how well the clinical programs do at attracting top residency candidates. This year, of the 15 clinical programs participating in National Residency Match Program, all 109 residency slots were filled. Among those incoming residents, 6.4 percent were SMHS alumni. Matthew L. Mintz, M.D. ’94, RESD ’97, FACP, assistant dean for pre-clinical education and associate professor of medicine, followed Simons’ remarks, presenting an update on the progress and success of the recent revisions to the M.D. curriculum. The programmatic modifications, explained Mintz, were guided by changes in the health care landscape and informed by research into how medical students learn best. However, he continued, medical education really hasn’t changed much from the days following publication of the Flexner Report in 1910 — in essence two years of preclinical education followed by two years serving clinical clerkships — but much has changed with regard to the science and practice of medicine in the intervening century. A key element of the revision, explained Mintz, was the decision to integrate much of the curriculum. Following a foundational course, students now take organ-system based block courses. The revisions also enhanced the school’s doctoring courses, previously known as the Practice of Medicine program. Now the program is divided into Clinical Skills and Reasoning, such as interviewing, physical examination, clinical reasoning, elements of public health, professionalism, cultural competency, evidence-based medicine, and communications skills; and Professional Development, including mentoring/ advising/ coaching, role development, wellness, elements of professionalism, ethics, humanities, end of life, and patient safety. Beginning in 2014, all first-year medical students receive new iPads to aid in the curricular revisions through the support of the White Coat Initiative run by the Office of Development and Alumni Relations. The revised curriculum emphasizes active learning principles, and technology is an important tool to achieve those goals. The iPads are enabling SMHS to move to a paperless system, with devices pre-loaded with apps supporting interactive reference materials and other resources to help students develop a deeper understanding of medical science and practice. 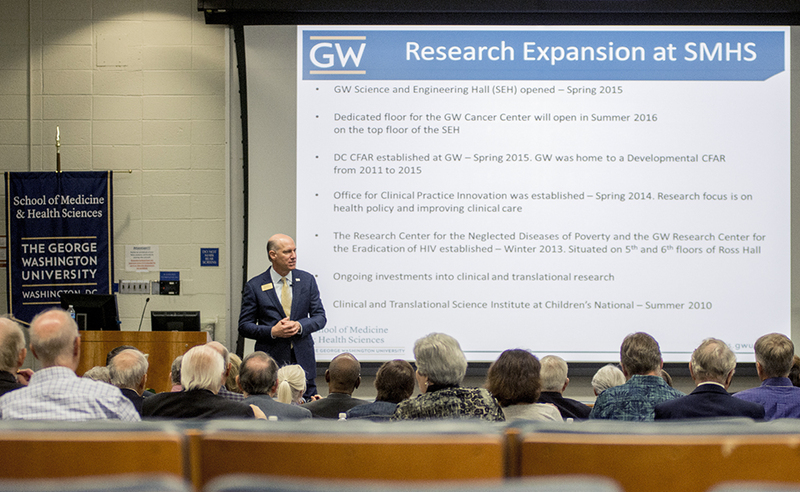 The final speaker in the 2015 State of the School address was the school’s newest academic leader, Eduardo Sotomayor, M.D., Ph.D., the inaugural director of the GW Cancer Center. An internationally recognized visionary in the field of lymphoma research and treatment, Sotomayor joined SMHS in July 2015. Previously, he served as the scientific director of the DeBartolo Family Personalized Medicine Institute, the Susan and John Sykes Endowed Chair of Hematologic Malignancies, and chair of the Department of Malignant Hematology at the prestigious Moffitt Cancer Center and Research Institute. As director, Sotomayor’s first task is to integrate under the umbrella of the GW Cancer Center all cancer research, clinical cancer care, and cancer control/prevention and outreach initiatives at SMHS, GW Hospital, the GW Medical Faculty Associates, and SMHS-affiliated health systems such as Children’s National. The goal, he said, is simple: to build a premier cancer center that excels in cancer research, clinical investigations, cancer prevention/control and policy as well as in education and patient outreach, and ultimately achieve NCI-designation as a comprehensive cancer center. Following the address, GW President Steven Knapp, Provost Steve Lerman and VPHA/Dean Akman installated Patricia S. Latham, M.D., Ed.D. ’15, professor of pathology and of medicine, as the inaugural Frank N. Miller, M.D. ’48, RESD ’50, B.S, ’43, Distinguished Teaching Professor. She also presented this year’s Annual Frank N. Miller Lecture.